"A meditative installation... which suggests the painful process by which memories are dredged up from the distant past. This quality is heightened by another device. Berliner set a pile of larger stones off to the side.... Viewers are directed to lay these irregular stones on the gravel bed, "beneath" the projected images, in an act of commemoration. As the irregular stones pile up, the projected images become harder to read, serving as a further reminder of the difficulties that accompany efforts to maintain a connection to the past." "... a mournful and affecting reflection on the Jewish custom of leaving pebbles for remembrance on the graves of family and friends. 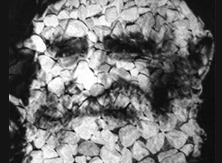 Black and white portrait photographs... are projected on a bed of black and white stones. This creates an even more mammoth family album - where haunting faces succeed (and merge with) one another, until the new image replaces the previous one that slowly fades and vanishes in the lingering, tender, regretful way that the features of the dead disappear from our memory." A memorial to memory itself.